The fallout of today’s nuclear option vote will be much worse than the harm done today. It is frustrating being a Democrat with a Democrat controlled Senate and a Democrat President and not being able to have our President have his nominations confirmed. The Republicans have filibustered nominees more during the Obama presidency than any other presidency. They have shown a level of disdain for this President and a near obsessive need to defeat every single thing he wants to do, even if that means we are short on judges. What makes it even more frustrating is that the Republicans are the ones in 2005 who demanded that judicial nominees should get an up or down vote. Remember Mitch? Of course you do not. Because back then you wanted an up or down vote only because the President was YOUR GUY. Now that the shoe is on the other foot, you couldn’t care less about “up or down” votes. Of course there is no requirement in the Constitution that the “advise and consent” be given via a simple majority (or up or down vote). The Constitution grants the Senate the power to make its own rules. The Senate rules includes rule 22. That rule allows for filibusters. Filibusters on legislation require a 60% vote to reach cloture. Filibusters on rule changes require a 2/3 vote to reach cloture. So did Harry Reid get a 2/3 vote to reach cloture for the rule change to limit filibusters on non supreme court judicial nominees? Of course not. If he did I wouldn’t be complaining as much. What he did was invoke the “nuclear option”. How does that work? Well, basically someone tries to reach cloture and it fails. So someone asks for a ruling by the chair on if it should take more than a simple majority to confirm a judicial nomination. The presiding officer will say no, that the filibustering of a judicial nominee is valid. That person then challenges the ruling of the chair. That vote is immediate. That vote is not debatable. That vote only requires a simple majority. Of course, that vote is also based on a lie. It requires the people voting against the chair to state that the chair is wrong when the chair is actually right. I opposed this proposed tactic when the GOP threatened to use it in 2005 I remember arguing with conservatives over and over about the myriad of falsehoods that the Sean Hannitys, Rush Limbaughs, and other conservative pundits were trying to share about the law. At the end of each discussion I would say that the nuclear option was wrong and that it didn’t matter who was using it. I never thought that I would have to be critical of the Democrats 8 years later. Unfortunately, that is where we sit today. The Democrats actually pulled the trigger and used this tactic. They have opened Pandora’s Box. Senator Reid claims that his use of the nuclear option would be limited to a distinct and discrete set of circumstances. But much like an actual nuclear explosion, the fallout from today’s wrong action will be much worse and more long lasting than the explosion itself. Now that the Democrats have used this tactic what happens if they lose control of the Senate? Do we believe that the GOP will not seek to further restrict the ability of the minority party to filibuster? If you think they will not, you are a fool. This is the same party that supports passing laws under the guise of “election integrity” to suppress votes. Finally, this situation will give the pundits (especially ones like the Daily Show) a lot of material for weeks to come. The hypocrisy on both sides on this issue is amazing. People who demanded an up or down vote previously and threatened use of the nuclear option who are now crying about someone else using the option are obviously hypocrites. I am sure that as the days, weeks, and months go by we will be shown many examples of conservative leaning politicians and pundits who previously supported the threat of the nuclear option who are now crying over it (and rightly so). However, people who criticized the use of the nuclear option in 2005 who now voted for it are also blatantly hypocrites as well. Louisiana Senator Mary Landrieu is one of those Democratic Senators. Here is her letter explaining her position on the nuclear option from 2005. I am sure that as the days, weeks and months pass by we will find many other examples of left leaning politicians and pundits condemning the GOP for the mere threat of the nuclear option who now applaud its use (and rightly so). In short, the Democrats are wrong for using the nuclear option, the GOP is hypocritical for crying about it, and this is a sad day for the Senate. The message the Democrats just sent is that if you don’t like the rules you can cheat to get around the rules. That is a horrible message. The Democrats would have been much better served if they would use this GOP obstruction during the off year elections. Now they have no such opportunity. If they try it will sound like the abusive husband who beat his wife and then said “look at what you made me do”. 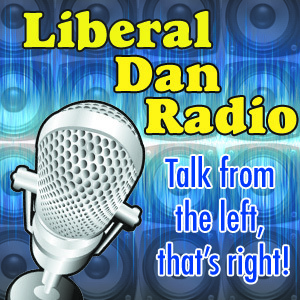 With me losing my heat and two vacations, it seems like this will be the only episode of LIberal Dan Radio for November of 2013. There is a lot to catch up on. George Zimmerman is at it again. He has been arrested again. At what point does he lose his rights to carry a weapon? At what point do his apologists say “enough is enough”? The insanity over the Affordable Care Act is continuing. It has caused me to create a new YouTube bit for the show. It is called Fat Man Rants. I will go over some of the points made in those videos. We also have people saying that the issues with the healthcare website are “Obama’s Katrina”. Yeah, I will lay into them too. A Walmart store has started a food drive to help employees assist other employees who need help eating on Thanksgiving. If you cannot see why this is wrong, I will lay it out for you. Earlier in the year, Governor Jindal cut funding to aid foster children once they turn 18 go to school and transition into adulthood by themselves. I am not sure how I missed this but I did not miss it tonight. All those plus Words of Redneck Wisdom, Tweet of the Week, Headlines and more tonight on Liberal Dan Radio: Talk From The Left, That’s Right.